You might think, gauging from recent blog posts, that we have been existing on chocolate smoothies, cake and biscuits. It’s a bit like photo albums (remember them, fellow oldies? ), where the main players are either on holiday or celebrating a major life event. Don’t even start me on Instagram and its artfully displayed kale and kohlrabi smoothies. Either way, what you see is not necessarily what you get. Strangely, the reverse is also true. This pasta may not look anything to boast about, but it has been a much-appreciated addition to my after-work winter repertoire. It’s quick, simple, sustaining and doesn’t require any fancy ingredients so you don’t have to disturb that exotic diorama you’re composing for tomorrow’s Instagram shot. If you’re cold and weary and really need the comfort that only a bowl of pasta can provide, this is the dinner for you. It makes a great weekend lunch too, but you’ll to follow it up with a bracing walk in the great outdoors or an hour of sofa snoozing afterwards. Use the best sausages you can find. I’ve made the assumption that if you’ve got this far, you don’t need me to tell you how to cook pasta. Put a medium-sized heavy pan over high heat and add the olive oil, followed by the onion and garlic. Turn the heat down, then squish the sausage meat out of the casing and into the pan so it forms tiny, rustic meatballs. Cook, stirring occasionally, until the onion is soft and the sausage is browned. Tip in the tomatoes and stir well, then let cook for 10 minutes over medium heat. Just before you’re ready to serve, pour the cream into the sauce and let it come to just before boiling. Taste and season with salt and pepper as necessary. Toss the pasta through the sauce, then serve at the table with lots of Parmesan. Serves four. What’s your current winter comfort food favourite? Alas, we can't. I doubt she goes in for many plates of pasta, cream and sausage in any case. Or chocolate milkshakes either, for that matter! 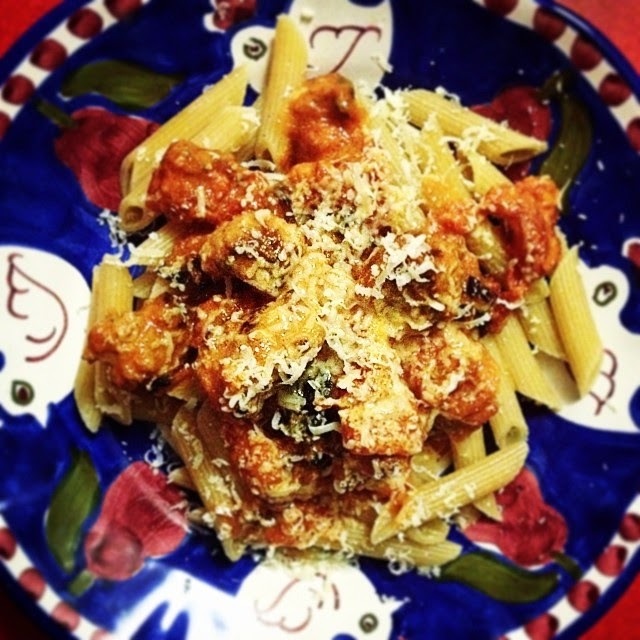 Lovely, and enough of a variation from my usual pasta whip-togethers to try this very night.. Thank you KitchenMaid!